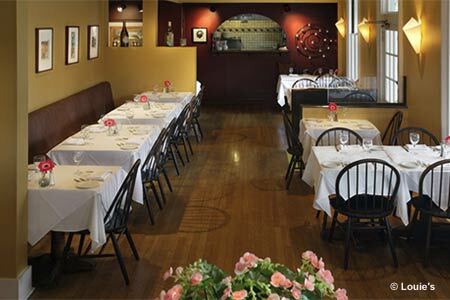 A quintessential Santa Barbara experience featuring California Wine Country-style cuisine in a country cottage setting. : There are few more quintessential Santa Barbara experiences than lunch or dinner on the sun- and moon-kissed veranda or in the paddle-fanned dining room of Louie's. In walking distance from Santa Barbara's popular State Street, it evokes a genuine California country cottage motif. The menu is high-end California bistro fare. Popular on the appetizer menu are angel hair pasta with tomatoes, capers and pine nuts; and crab meat dumplings in a cream sauce with sun-dried tomatoes and artichokes. We're fans of the gourmet pizzas, with toppings like Cajun chicken and pineapple or caramelized onions and Gorgonzola. For entrées, we recommend the Scottish salmon served with a homemade chutney of mango, pear and Mandarin orange, a lime beurre blanc and red curry mashed potatoes. We also like the ahi, seared rare, served with tomato polenta and marinated onions and peppers. For dessert, you can't go wrong with peanut butter pie or a warm chocolate brownie, its richness toned down with vanilla gelato. The wine list is constantly changing and heavy on local reds and whites. Parking is limited to residential streets and can at times be tough to find.